Would you be so kind as to decode this 1974, 914 VIN? Thank you. 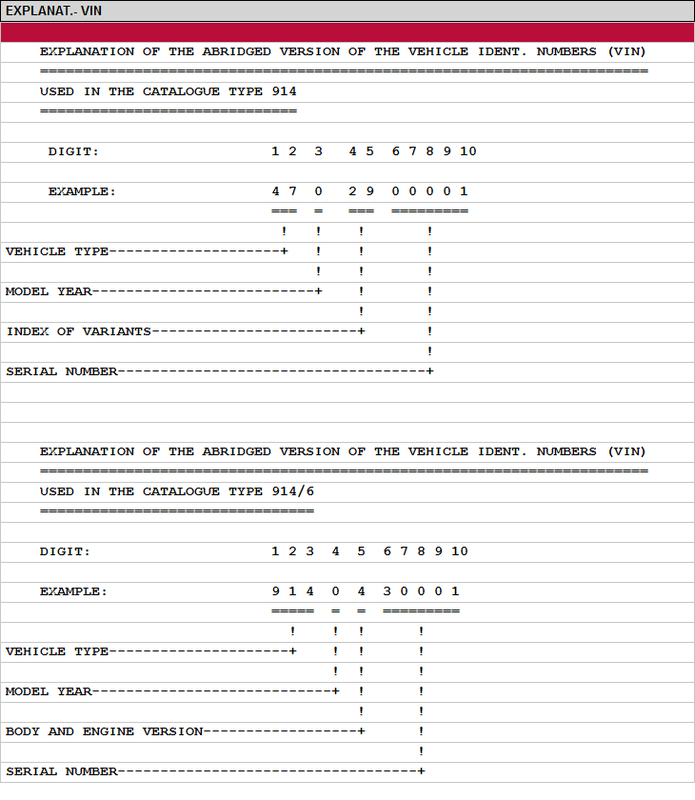 the first and second digit "47" is the vehicle type the third digit is the the model year "4" (1974) The "29" is called a "index of variants" The remaining numbers are the serial numbers "13484"
That is how they are broken down as far as I know. a Type 47 is not a 914/6. Type 47 where made for Volkswagen while Type 914 where made for Porsche. The Factory Type shield in the trunk will tell the manufactorer. The 914 was a Porsche design but Porsche was short on money so they decided to do a Joint Venture with Volkswagen. All 914 Bodys where made at Karmann at Osnabrück and all Type 47 where assembled at Osnabrück replacing the VW Type 34 Contract so the where manufactured from Volkswagen. Porsche in Zuffenhausen got the Bodys and assembled the Cars in Stuttgart and so they where manufactured by Porsche. The VIN provided is not a 914-6. It is a 1974 914-4 cylinder car.